Bottom/back inside angle app. 20 degrees. 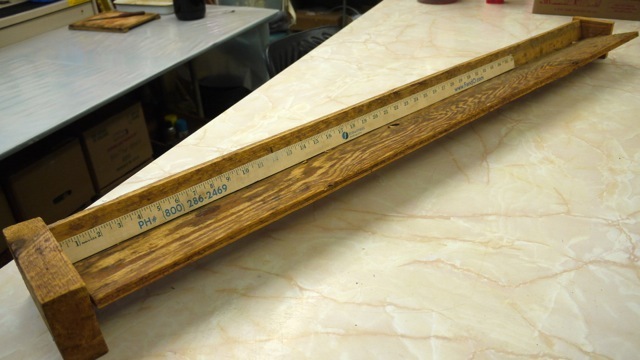 Of course different wood construction materials can be used depending on availabilty. 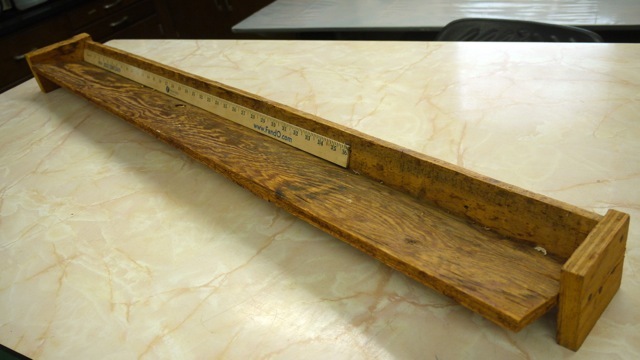 Secure a yardstick or 48 inch measure (recommended, if you can get or make one) on back tray board as pictured. 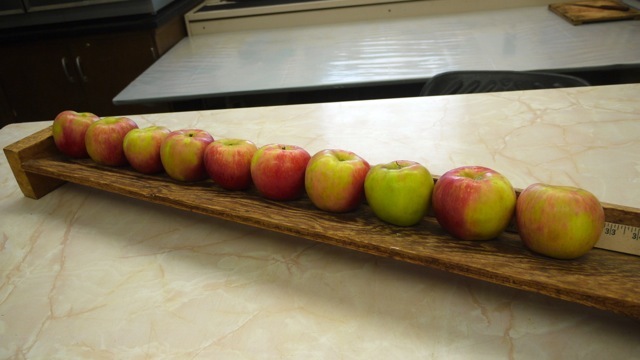 To measure the L/D ratio, first place 10 apples as pictured below (first) to get the "length" measurement. 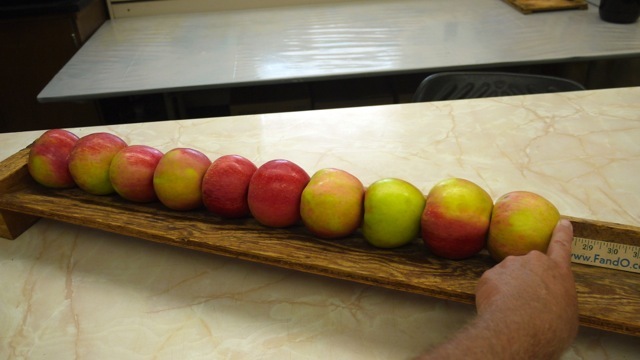 Divide the total length by 10, to get the average apple length. (As pictured, app. 2.8 inches). Then, place the apples calyx-down (pictured below, second) to get the average diameter. (3.3 inches as pictured.) The L/D ratio is then 2.8/3.3 equals 0.848 for these Honeycrisp apples. You can also use the L/D board to quickly assess apple red skin color. Assuming the fruit is 50% red, place the green side of the apple outwards and estimate how mcuh of that half of the apple is green vs. red. If it looks like the apples are half red on the "green" side you are viewing, and assuming the other side of the apple is fully red, then the average red skin color is 75% red. (Assuming 50% or fully red on the hidden side of the apples, 25% or haf-red on the viewed side of the apples, equals 75% total red skin color.) This procedure can be modified as necessary to get the approxiamte % red skin color.